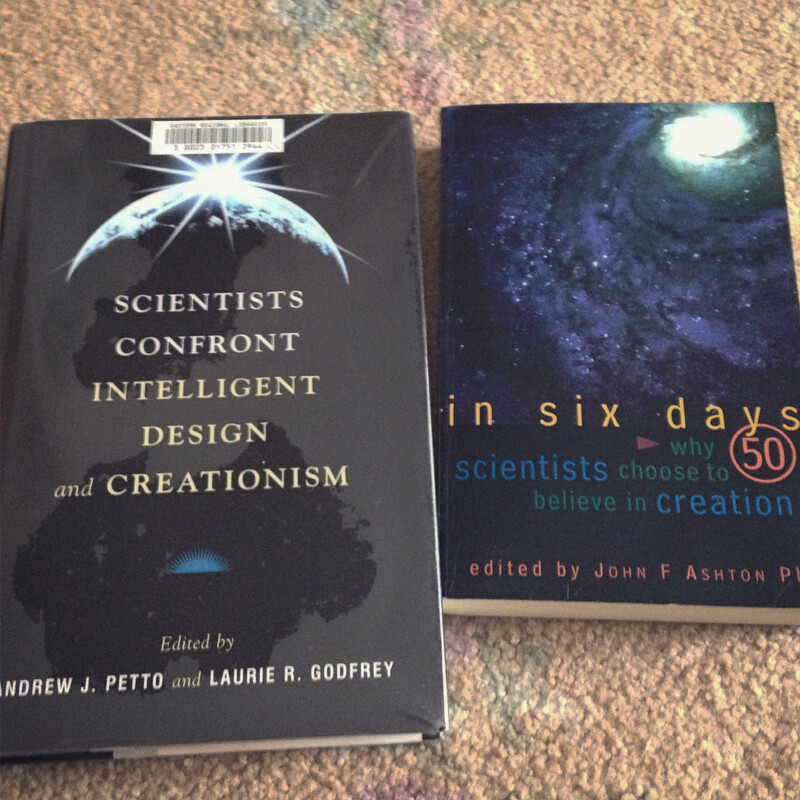 On the evolution side: Scientists Confront Intelligent Design and Creationism edited by Petto and Godfrey. On the Young Earth Creationist side: In Six Days edited by Ashton. Not pictured: Intelligent Design by Dembski (I owned a copy that I read years ago, but it was the victim of a recent possession decluttering rampage). Not represented: the myriad religious interpretations of the origin and development of life, including a whole lot of very diverse Christian approaches. I will definitely and clearly state upfront that I am being an intentional fence sitter and won’t be proposing any personal beliefs on the One True And Correct Narrative On The Way The Universe Came Into Being. I have my own views, but I just can’t be bothered going down that fruitless and negative route attempting to explain it in a calm and reasonable fashion, offending just about everyone I know in the process. Some days I wish I could just say, well, maybe the Poetic Edda of the Ancient Norse peoples and their modern counterparts is the only true explanation of the universe, so in light of Ymir and his cow Auðumbla, who formed Búri while licking the ice, let’s stop all our bickering. But as a bit of a challenge to myself I decided I would have some geeky fun and read some diametrically opposed books. Both are collections of essays written by highly educated scientists. Both are heavily referenced and ask some very interesting questions about life, the universe and everything. Both point the finger at the other to show how wrong the other side it. It really is fascinating. The Petto & Godfrey book is an excellent text, very thorough and accurate in its understanding of Creationist perspectives. The Ashton book is an interesting text that explores how scientists try to make sense of their field of research while rejecting materialist philosophy. Because I know and care about people with strong feelings about the topic on both sides of this fence (not to mention a whole lot of in-between perspectives) I will avoid (for now) making any discussion of where my understanding lies. It’s a discussion I find is best had face-to-face. I long ago learned that social media doesn’t always provide the kindest environment in which to explore these concerns. Posted in book review, religion, science and tagged books, creation, currently reading, essays, evolution, science on July 29, 2015 by Fiona.